After our stint of fun in the desert my awesome Danish friends and I went to Cuzco, a grand 3326 meters (10,912 ft)high. I wasn’t sure if I would be one to get altitude sickness. Getting off the bus I noticed it was noticeably colder than the desert and it was hard to breath. The next day I had chills and was incredibly achy. I wrote it off as altitude sickness because I couldn’t walk very far without having to stop and sit. I even tried coca tea for the first time, a remedy for altitude sickness. However, I didn’t have altitude sickness, I had a bacterial infection which got worse as the day went on. I was a little worried because we already got our tickets for Machu Picchu before it got really bad and I wasn’t sure I would be able to hike up that mountain like this. I spent the whole night running to the bathroom. I vomited blood. It was a really special night for me, I got really intimate with the toilet and how long it took to get to it from my bed. The next day we were picked up by a bus to drive many hours to a train that would take us to Aguas Calientes, the starting point to walk up Machu Picchu. I hated that drive so much, the car was so tiny and we were smushed in there with a bunch of other people and I was hoping no urges to vomit or other would happen on the drive. I didn’t eat anything. The train we took, which was only 20 minutes long, was a segregated train where tourists get the back car. Some obnoxious American remarks how this was like slavery days in the U.S. Only an American would say something stupid like that to a conductor, or so I thought. He wasn’t the last to put up a fuss, a German on the way back threw the biggest tantrum I have ever seen anyone throw in my life over it. His girlfriend was from Peru so they couldn’t sit together and she didn’t want to pay more to go in the tourist car with her boyfriend. He said the train workers were worse than Hitler and said other horrible things in German (his Spanish was incredible, so was his anger… he shook as he screamed). We were all relieved when the pair decided to walk. I am all for the split car situation. These folks live here and use that train to transport their goods that they sell. If they had to share cars they would have to fight for room with backpackers and their bags, have pictures taken of them because they all wear traditional clothing, and be around obnoxious tourists on their daily lives because tourists visit here in hordes every day! If I had to take public transportation every day and I had loud Argentineans there taking my picture and doing what they do best, be loud, I would go crazy. That’s just an example. I ate for the first time that night after finally getting the appropriate medication. We only had yogurt for breakfast, and we started on our walk. We left at 4am and it was still night out. The sky was clear and we could see the starts. The moon wasn’t full but close so the moon helped light our way, and illuminate the mountains that were so incredibly close. The valley this town was built it is tiny and it is kind of scary to look up and see this huge mountain silhouette as you walk around. I was completely at peace at this moment, thinking about everything I had seen up to this point and finally am about to see one of my most anticipated locations of my life. My peace disappeared as soon as the uphill started. I am not a fan of hiking up stairs. The stairs are tall and harder for short folks like me… but that wasn’t the biggest problem. I had only last night’s meal for energy after having not eaten much the two days before. We were 2400 meters (7,875 ft) high and I was dizzy from either lack of energy or lack of oxygen but my head hurt and I wanted to throw up the harder I pushed myself. It may be lower in elevation than Cuzco, but at a certain point it's all just pretty much high. It was quite possibly the hardest hike I had ever done in my life because I wasn’t yet over my infection. It wasn’t that amazing when we got to the top like I had hoped. We didn’t beat the first bus like we had meant to, and my first view of Machu Picchu was kind of like “okay, so here it is”. We got in line for Wanu Picchu, the other mountain you can climb up and be high in the clouds with a very bird’s eye view of the Lost City. 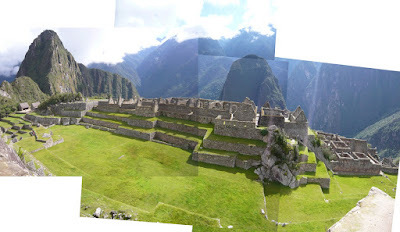 We got our tickets and got a tour guide… but I told my friends I would probably not be able to do Wanu Picchu despite having planned to do it this whole time. I was too sick and had to sit ever 100 feet, usually because my stomach would cramp really bad. Ingunn started getting upset to her stomach as well and we decided with two folks down we couldn’t go up the awesome mountain. Machu Picchu came to life on our tour and I became very fascinated on the lives of the people who lived here and built this city. They were smart and crafty, their architecture has continued to fascinate researchers for years. I touched everything, and breathed in everything. The sun was out, it was warm, the grass was impressively green since it was the beginning of the rainy season. Everything the guide said was fascinating. I absolutely loved being there. After our guide left us we ate some incredibly over priced food, paid for the toilets to relieve ourselves from our ailments (Jacob got it too) and went exploring more. First was to the llamas! 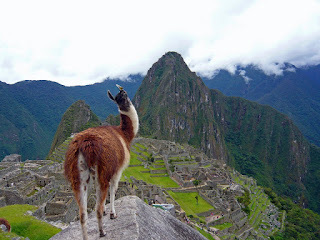 Relatives to the camel, alpacas and llamas are common cuties of Peru. (I mention only them because I can’t remember the names of the other ones, but know there are many others like llamas with different length in hair, height, tails, and so on) They made for some great pictures because they were right where that classic view of Machu Picchu is, the one you see on postcards. After walking around some more my fun friends wanted to leave. I wanted to stay and soak up more of this place which I may never come back to. Ingunn said it would be fun to play hide and seek, which sounded like fun given all the fun nooks and crannies to hide in here. But we decided we were all too sick to try. We spent 20 minutes playing with the water in the water system built by the Incas. We even drank some just before we overheard a guide saying it wasn’t safe. The water source was a stream in the mountains, I already had a bacterial infection so what more can possibly happen? Ingunn posing over the steps. 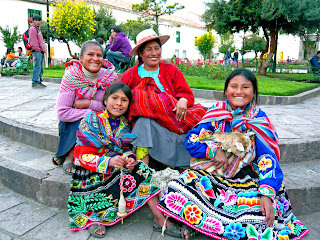 Local women in Cuzco and their baby goat. Back in Cuzco I parted with my awesome friends to walk around the city alone. I found myself so far up the hill and away from tourists I was transported into another time period. No cars were able to drive that far up, the roads were narrow and walls high. At times you could see through a break in a wall where there weren’t houses and see a bird’s eye view of the city of red roofs below. It was beautiful. I met a girl from Fairbanks, Alaska up there. 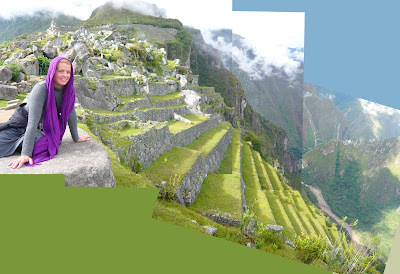 She had moved to Cuzco to open a school and a coffee shop. How random. This is one of my two solo explorations on foot that I had in Peru. The second was on an island on Lake Titicaca. You will read about that one in next blog.